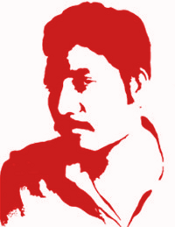 Sarbaharapath | Siraj Sikder: Cadres of East Bengal Workers Movement, Be brave! Firmly seize political power! Annihilate national enemies! Build National Liberation Army! Carry out program! Siraj Sikder: Cadres of East Bengal Workers Movement, Be brave! Firmly seize political power! Annihilate national enemies! Build National Liberation Army! Carry out program! The Pakistan colonial ruling regime and its running dog, the traitors of East Bengal have occupied most of the district and sub-divisional towns, and they have kept their seizure there. The unoccupied districts or sub-divisions will be occupied by them soon. In cities, the resistance of Awami League, rebel Bengal Regiment, EPR and Police is breaking down. The Pakistani colonial ruling regime has kept continuing their fascist atrocities there, and they are trying to restart their broken apart civil administration and carry business, commerce and plunder. The police stations and posts in the rural areas of East Bengal are inactive. They are not carrying any activities against the independence, people and revolutionaries of East Bengal, or if any of them want to do so, don’t dare to. Many of them support the independence of East Bengal and many are collaborating with Awami League. In some areas, Thana civil administration is functioning, whereas, in some areas, is inactive. They are also not doing anything against the independence, people and revolutionaries, or if anyone wants, don’t dare to do so. Local goons, tyrants and national enemies are sustaining by depending on their own strength, while some are sustaining by keeping relation with Awami League. They, too, are not daring to openly do anything against the independence of East Bengal. The situation of Awami League is moribund. In some of the areas, their leaders have fled while in other areas they became inactive. Grass root cadres became leaderless and inactive. Because of inner quarrel, pressure from colonial government, incapability of relying upon masses and revolutionary work, despite Indian support and the support from Bengal Regiment, EPR and Police, they lost self-confidence. They got the chance to seize political power, but they did not do so to make use of it for the sake of people. Moreover, they gave shelter to fund embezzlers, profit suckers, black marketers, goons and national enemies. Their failure and bankruptcy became clear to the people. People understood that independence of East Bengal is not possible by Awami league. People have high political consciousness, tense aspiration to overthrow black-marketers, stock-marketers, usurers, national enemies and colonial ruling regime, and they want to carry the liberation war, take part in it and help it. Because of the usurers, black-marketers and stock marketers, in rural areas, price of daily goods seriously increased artificially and consequently, people’s economic condition reached at serious crisis. Other reasons are migration of workers from urban to rural and job crisis in villages. From the above mentioned situation, we see, in cities, authority of the colonial ruling regime has been forged and is being consolidated, and they are able to do so. But in vast rural areas, they don’t have any control. They will need much time to get it back as before, especially, it takes long time to utilize employees of administration against independence of East Bengal, deploy Police force in stations and make them do anti-independence activities. At present, it is not possible for the army to take position in police stations and seize villages from there due to lack of number and armed resistance from the people and revolutionaries. They will deploy a large number of forces (they will not deploy a few in number as there is possibility of being crushed) in one after another areas and carry “Search and crush” and “encircle and suppress” campaign, kill everybody, burn everything, loot everything and return back to their bases in cities. In this situation, in vast rural areas, it is possible to establish government of Republic of East Bengal, annihilate national enemies, forge national liberation force and carry out our program. In rural areas, village and Thana-based committees of republic of East Bengal, have to be formed. Committee will call meeting of people and will be elected by them. There will be representatives of agricultural workers, poor peasants, workers, middle peasants, patriotic zamindars (Zamindars are the big feudal landlords—Sarbahara Path) and bourgeoisie and also our representatives in the committees. There will be president, vice president and members (5 or 7 in number) in each committee. We have to implement our program through these committees. Black-marketers, stock marketers and super profit suckers must be punished. Audit of school, college, Union Council etc institutions must be carried. Money embezzlers must be punished. The decision of committee should be executed through people, guerrillas and armed masses (village militia etc). In rural areas, to put national enemies on trial, punish them, distribute their lands, abrogate usury and end injustice by justice, forge village court, stop theft, robbery and corruption. In the villages, to collect tax forcefully from national enemies. To collect subscription from people according to their abilities. To carry propaganda for resistance among masses, organize people in village militia and from them, recruit those who want to join army. To keep school, college, hospital and other institution of people open. In rural areas, army can recruit members from people. It is possible to sanction allowance for them with the money and food of national enemies. They can be armed with the police arms of police stations that we can inactivate, by capturing weapons of national enemies, with the weapons collected from those people who are not fighting, and with domestic weapons. Arms can be collected from the army by carrying annihilation against it. To form a section with seven or nine people, a squad with three sections and a platoon with three squads. Each unit will have a commander and an assistant commander. They must study Discipline, Three articles and People’s War from Quotation. They must learn long march, surprise attack, throwing bomb, arrow, spear, knife, sword and bayonet charging. Party members should be recruited from them. Party committee should be formed among them. This army will seize various villages and small towns, establish political power and arm local people. It will build party organization, carry propaganda and recruit members. With the help of local party cadres, the squads of liberation army will enter villages one after another and annihilate national enemies. To gain people’s support, if condition allows, it will hold public meeting and execute the above mentioned program. It is possible for this army and political power to sustain and develop at the present period. If local administration of the Pakistan colonial ruling regime and their collaborator national enemies can forge their control in rural areas, it will be difficult for the revolutionaries to carry clandestine work and develop there; there will be low tide in revolutionary work in fascist control. So, at the present opportune moment of revolutionary tide, let us seize vast rural areas of East Bengal, establish political power, build national liberation army and carry out program. ♦ Long live the East Bengal Workers Movement! ♦ Establish the Republic of East Bengal! ♦ Build National Liberation Army! ♦ Destruction of Pakistan colonial fascists is inevitable! They are paper tigers! ♦ Proletarian revolutionaries and masses of East Bengal, Unite! ♦ Smash revisionism, neo revisionism, Trotskyism-Guevarism, conspiracy and treachery! ♦ The East Bengal Workers Movement is correct! Unite under it! ♦ Our victory is inevitable!